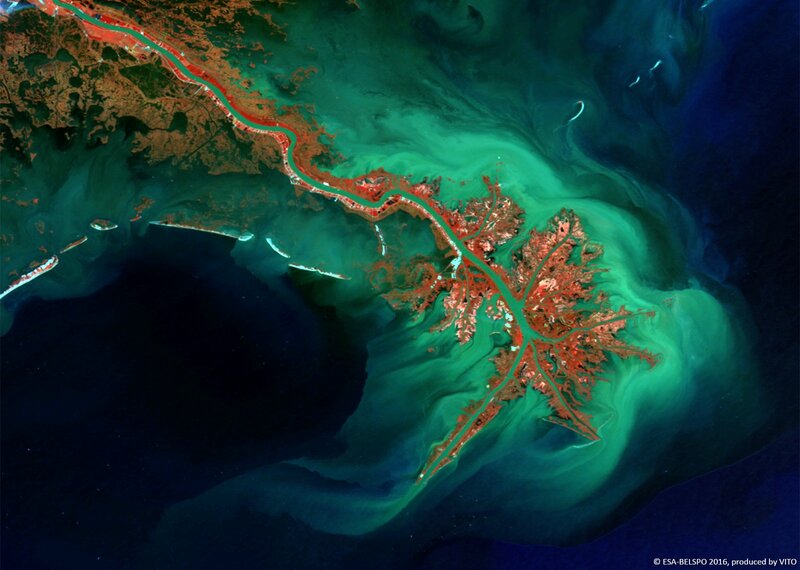 The Mississippi River Delta along the south coast of Louisiana (USA) covers about 12,000 km² and discharges on average about 17,000 m³ per second into the Gulf of Mexico. This week’s image (6 October 2016 at 100 m) shows the Mississippi Delta with its characteristic bird foot pattern. Also visible, in greenish taints, are large sediment amounts that are transported and deposited by the Mississippi River to continuously change the Delta’s shape. PROBA-V’s centre camera proves well suitable to obtain valuable information on some ocean colour parameters. In the Advanced Land, Aerosol, and Coastal Products for PROBA-V (PV-LAC) project, the Coastal Products Activity focuses on retrieving information from PROBA-V 100 m observations on among others Suspended Particulate Matter (SPM). These observa​tions are especially useful to detect and monitor both natural and anthropogenic small-scale coastal dynamics near estuaries and ports. Further, in the Advanced Atmospheric Correction Activity, research on an improved joint aerosol and land surface reflectance retrieval is performed by the Belgian company Rayference.